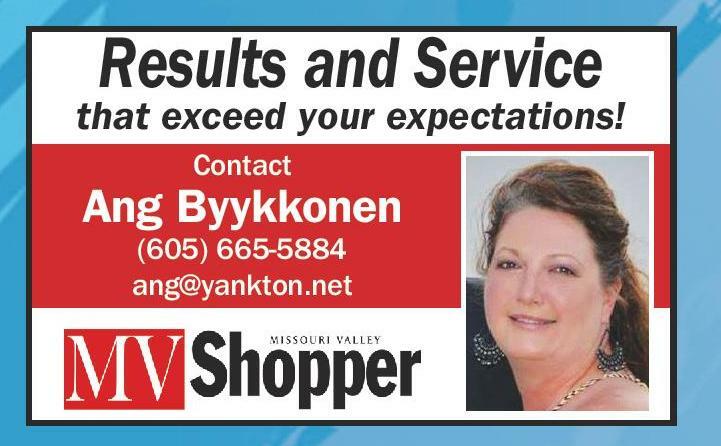 January 16, 2018 • Page 12 shop online at www.missourivalleyshopper.com HERE’S MY CARD Keep the numbers of these locally owned businesses on hand for all your service and shopping needs. 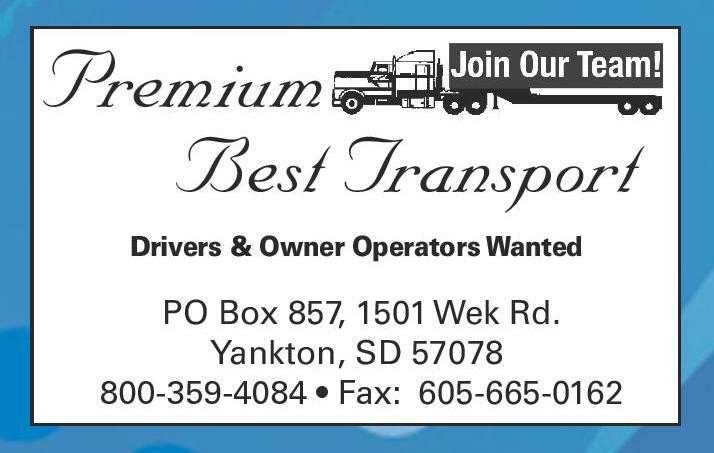 Premium Best Transport Drivers & Owner Operators Wanted PO Box 857, 1501 Wek Rd. 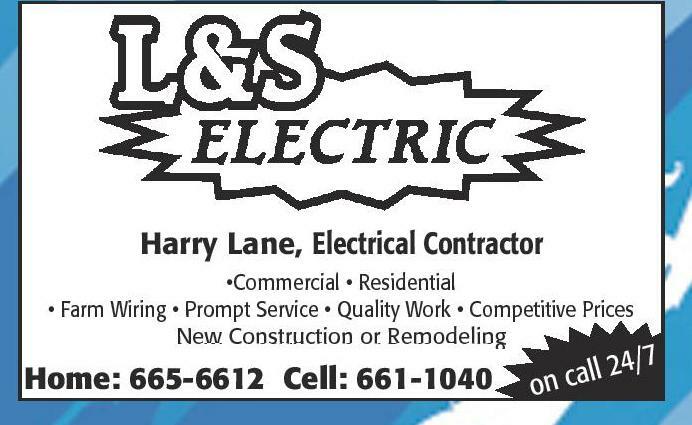 Yankton, SD 57078 800-359-4084 • Fax: 605-665-0162 Harry Lane, Electrical Contractor •Commercial • Residential • Farm Wiring • Prompt Service • Quality Work • Competitive Prices New Construction or Remodeling Home: 665-6612 Cell: 661-1040 24/7 n call o All truck and trailer repairs from D.O.T to overhauls. 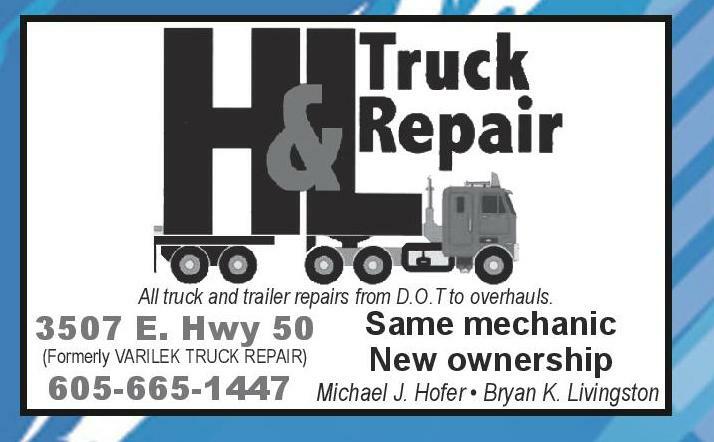 3507 E. Hwy 50 (Formerly VARILEK TRUCK REPAIR) 605-665-1447 Same mechanic New ownership Michael J. Hofer • Bryan K. Livingston ROD’S PIDDLE SHOP Small Piddle Repair Jobs • SNOW BLOWER SERVICE & REPAIR • LAWN MOWER SERVICE & REPAIR • REPAIR TRAILER LIGHTS • SOME METAL WORK 605-237-1176 Serving the Yankton Area New construction, Remodel, Siding, Windows and Doors, Fences and Decks Free estimates Big and Small projects we handle them all, just give us a call. 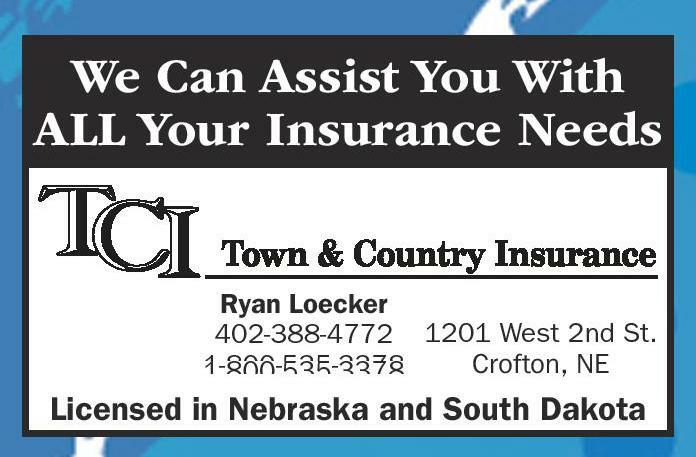 Call Rod Wiese (605) 689-3817 4410 W. 8th St. • Yankton, SD John Ruud, Owner Yankton, SD We Can Assist You With ALL Your Insurance Needs Ryan Loecker 402-388-4772 1201 West 2nd St. Crofton, NE 1-800-535-3378 “Don’t Gamble” - Insure With M.T. & R.C. 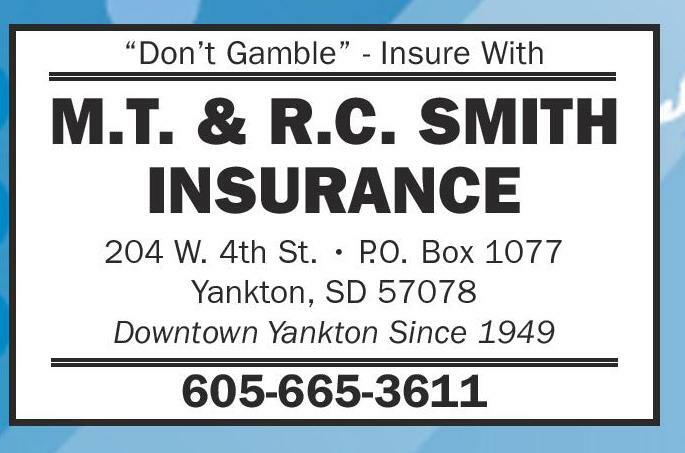 SMITH INSURANCE 204 W. 4th St. • P Box 1077 .O. 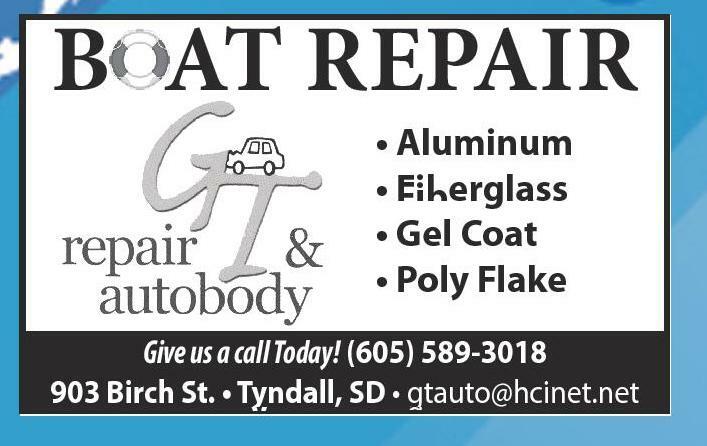 Yankton, SD 57078 Downtown Yankton Since 1949 Licensed in Nebraska and South Dakota 605-665-3611 B AT REPAIR imagine... A TOTAL TRANSFORMATION • Aluminum • Fiberglass • Gel Coat • Poly Flake Give us a call Today! 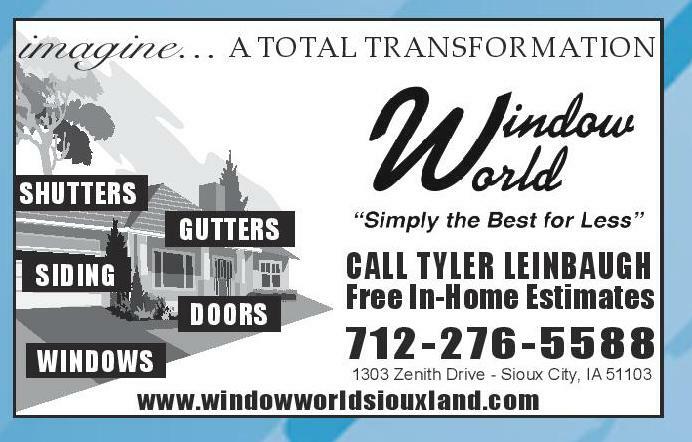 (605) 589-3018 903 Birch St. • Tyndall, SD • gtauto@hcinet.net National Coin Company SHUTTERS SIDING GUTTERS DOORS WINDOWS CALL TYLER LEINBAUGH Free In-Home Estimates 7 12-276-5588 1303 Zenith Drive - Sioux City, IA 51103 www.windowworldsiouxland.com Allow us to be your Auto Aid! 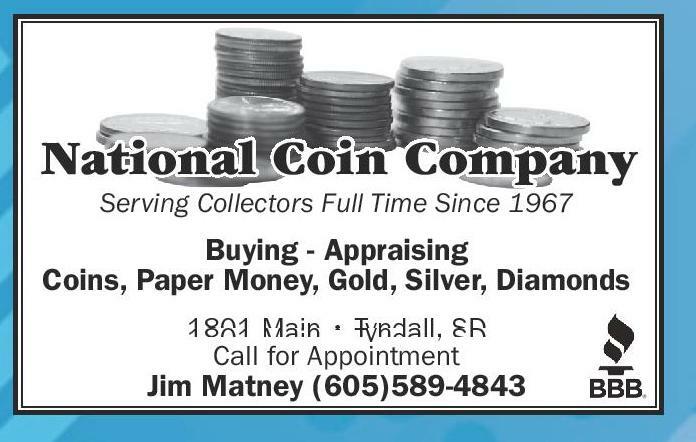 Serving Collectors Full Time Since 1967 Buying - Appraising Coins, Paper Money, Gold, Silver, Diamonds 1801 Main • Tyndall, SD Call for Appointment We Work with All Insurance Companies Jim Matney (605)589-4843 East Hwy. 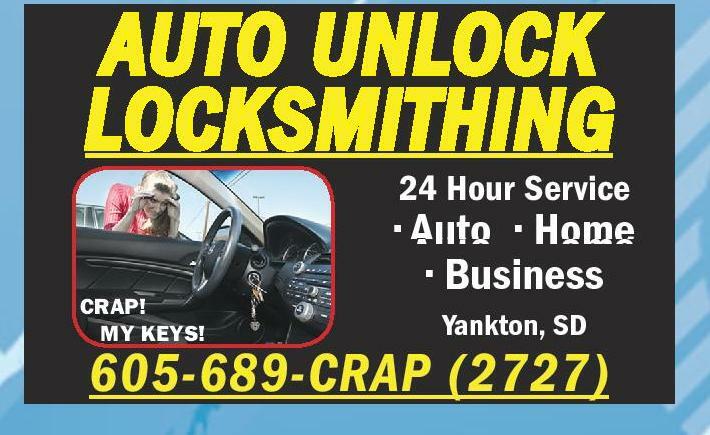 50, Yankton Results and Service AUTO UNLOCK LOCKSMITHING that exceed your expectations! 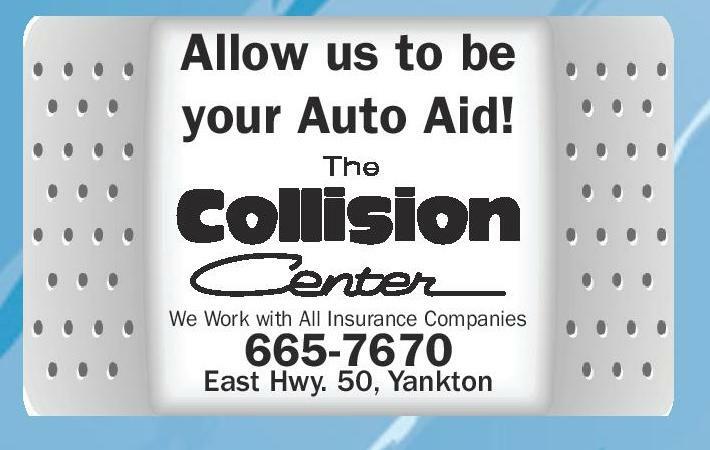 Contact Ang Byykkonen 665-7670 24 Hour Service (605) 665-5884 ang@yankton.net CRAP! MY KEYS! 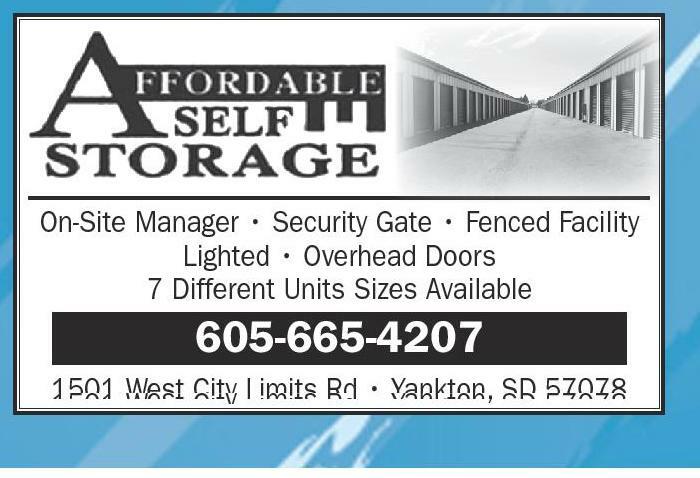 • Auto • Home • Business Yankton, SD 605-689-CRAP (2727) On-Site Manager • Security Gate • Fenced Facility Lighted • Overhead Doors 7 Different Units Sizes Available 605-665-4207 1501 West City Limits Rd • Yankton, SD 57078 To advertise in our next specialty business directory, call the Missouri Valley Shopper at 605-665-5884 Webster Soldier’s Vietnam War Collection Donated To State Historical Society PIERRE, S.D. 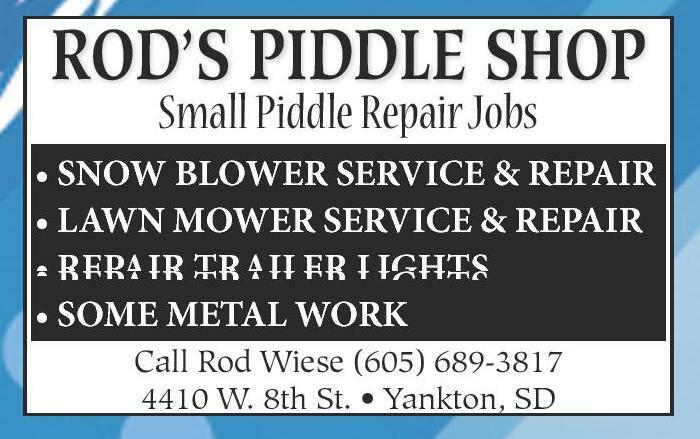 – The South Dakota State Historical Society-Archives recently received a collection of Vietnam War-era photographs, numerous letters and a journal written by Webster soldier James C. Walton, Jr. The bulk of the collection consists of letters sent by Walton to his parents, James and Helen Walton of Webster, while he served in the United States Air Force during the Vietnam War. He was stationed in Vietnam from June 1969 to June 1970. Sgt. Walton was a Senior Security Policeman, Law Enforcement in the 3rd Security Police Squadron at Bien Hoa Air Base in Vietnam. The correspondence and other items donated by Sgt. Walton reflect his service while stationed at Lackland Air Force Base (Texas), Maxwell Air Force Base (Montgomery, Ala.), Bien Hoa Air Base (Vietnam) and Lowry Air Force Base (Denver, Colo.). He served in the United States Air Force from 1967 to 1971. In a letter dated June 21, 1969, the first letter Sgt. Walton wrote home, he describes his first night in Vietnam: “Dear Mom and Dad, Well, Uncle Ho really put out the welcome mat for me last night. At about 9:30 p.m. we got hit by rockets. My first night here and already I’ve been through a rocket attack.” He also described his first impressions of Bien Hoa Air Base: “… it’s a pretty good sized base, and there are Army troops stationed here. We have mostly fighters, cargo planes and helicopters … I can’t say I like it here, because nobody likes it, but it is the best base in the Republic of Vietnam.” State Archivist Chelle Somsen says, “We are grateful to Mr. Walton for donating this collection of letters and photographs from the Vietnam War era. The collection’s historical topic and time period, in particular the Vietnam War, is a welcome addition to the archives collections. We are hopeful that other items concerning South Dakotans in the Vietnam War make their way to the South Dakota State Archives.” The collection also includes a daily journal written by Sgt. Walton while serving in Vietnam. In his last written entry from June 16, 1970, he noted: “Just got done taking a shower. My last one in Vietnam … Sure will be nice not to hear impacts at night. This will probably be my last dittie. Waited 363 days for this. About 40 hours and I’ll be home. WOW!!!! Better get ready. Sure hope it quits raining.” Three photo albums of images from Vietnam supplement the collection -- specifically photos of the Bien Hoa Air Base and of convoys secured by Sgt. Walton. Two other items of note include an English/Vietnamese dictionary and an Air Force pamphlet titled “Information on Vietnam for Air Force Personnel” dated July 10, 1968. 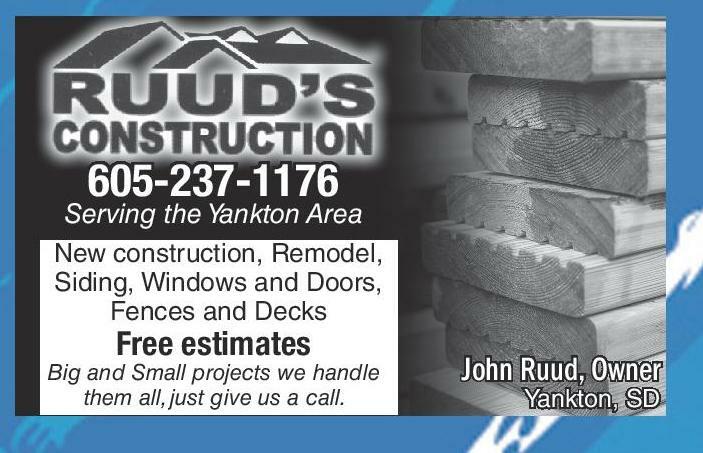 To donate historical items related to South Dakota’s history, please contact the South Dakota State Archives by phone at 605-773-3804 or email at archref@state.sd.us. The State Archives is located at the Cultural Heritage Center in Pierre. 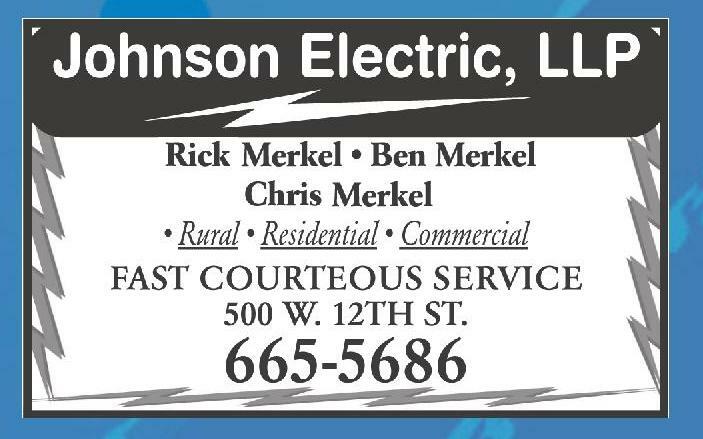 Public hours are 9 a.m.-4:30 p.m. CST Monday through Friday and the first Saturday of most months.